It has been my happiest dream to write novels ever since I was in fifth grade and my dear white-haired teacher, Mrs. Kean, told me I would. She told me not to worry that I couldn’t seem to get the math, because I had a flair for writing, and when I grew up, people would enjoy the books I would write. At that moment, my own favorite books were Alice through the Looking Glass, Beautiful Joe,and Charlotte’s Web. In the decades following Mrs. Kean’s prediction, I went on to explore many diverse paths in my life, always feeling that I was “supposed to be” writing novels. I earned masters degrees in English and Counseling. At various times I have taught college English, painted pet portraits, and worked as a bilingual elementary school teacher. I am now a psychotherapist in private practice. Like Carlotta in The Reluctant Fortune-Teller, I have been constantly on to the next Project. And like Norbert, I believe that we grow into ourselves, throughout our whole lives. I have always been a voracious reader. My strongest influences are British humorous writers of the 1920s and 1930s: P.G. Wodehouse, E. F. Benson, D. E. Stevenson, Stella Gibbons, and Elizabeth Von Arnim. It is my greatest pleasure to sit quietly, get in the zone, and let the characters that come to me live out their dramas and comedies on the page. Especially their comedies. I hope that you enjoy reading my books as much as I enjoy writing them. Pictured here are my animal muses: five little dogs and one audacious cat. 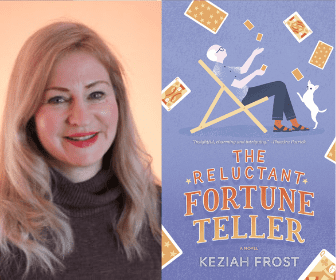 Keziah is available to meet with bookclubs via NovelNetwork. View her schedule of availability here.